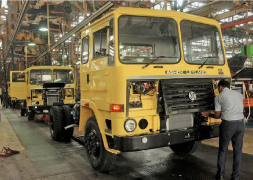 Ashok Leyland’s ‘Stallion’, the logistics vehicle, had just been inducted into the Army. The Karghil war demanded scaling up of supplies. The vehicles were put under severe stress in hostile terrain at 5000 metres with a completely untrained army of drivers and totally unfamiliar mechanics. There were catastrophic vehicle failures. We threw in all the service support that was necessary. Our stallions toiled round the clock. India won the war. That was our victory too! Established in 1948 as Ashok Motors to assemble Austin cars, the promoter, Raghu­nandan Saran, took bold to enter into a collaboration with British Leyland Motor Corporation to produce commercial vehicles. Through these decades AL maintained its lead as a major producer of buses for the numerous transport corporations spread across the nation as also medium and heavy commercial vehicles for truck operators and infrastructure projects. British Leyland was then among the technology leaders. The policy of indigenisation was seized by a number of entrepreneurs, to set up ancillary industries to supply components and other services. 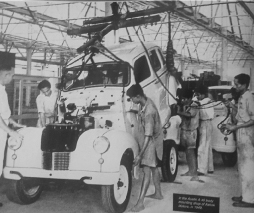 In the initial decades run by the British managers, the focus in Ashok Leyland was on indigenisation, developing vendors and the market for medium commercial vehicles establishing a vast dealer network, ensuring the reliability of the vehicles and attending to repairs in quick time. In the initial years, there was competition from Telco (now Tata Motors) which had financial and technical collaboration with Daimler Benz, Hindustan Motors and Premier Automobiles. The latter two phased out commercial vehicle manufacture: competition was essentially between the Tatas and AL. Indian businesses were impacted by the severe foreign exchange crunch through the next two decades that stunted growth. Control of AL was still in British hands. With the British industry severely troubled by labour problems, there was declining interest in meeting the increasing funding needs of AL. A major turning point came in 1977. George Fernandes as Industry Minister mandated as 40 per cent limit to foreign shareholding for most foreign companies. RJ Shahney, who headed with distinction Jessop & Co in Kolkata, took charge as Managing Director. Another illustrious leader from ­Delhi, Mantosh Sondhi, was the non-executive chairman who took care of the several clearances needed at Delhi. This duo also assembled rich talent fro the public sector: S.V.S. Raghavan, Joy Joseph, V.R. Pappu, K.S. Ramakrishnan joined AL. R.J. Shahaney also groomed brilliant young recruits like R. Jagannathan, Ananthanarayanan, S. Nagarajan. These strengthened finance and administration under the brilliant chartered accountant, R. Seshasayee, who joined AL a year ahead moving from Hindlever. Soon you noticed plans for massive expansion with a vast geographical spread. Along with sprucing up the old plant at Ennore, AL planned to set up new units at Hosur (TN), Bhandara (MR) and Alwar (RJ). The commercial vehicle industry had its cycles of boom and slump. Thus the ambitious plans took long to take shape. The quickest expansion was witnessed at Hosur. A significant development was the collaboration with Hino Motors, Japan, to produce engines with much higher power. For the habitual over-loading practice of most of the Indian truck operators, these engines helped AL build a reputation for reliable haulage. With the decline of the ­British automobile industry, Leyland Motors, wanted to sell off its stake in AL. There were many interested in bidding for their shares. The Hindujas, Rahul Bajaj, Amalgamations and even the employees union were among the suitors. Kuchelan, the leader of the AL employees union, referred to this at the 70th year celebration: “the amount involved was Rs. 6 crore. We were keen to buy the shares of British Leyland”, he said. The professionals at the helm preferred the Hindujas. This is understandable for the freedom they would continue to exercise with the new owners not breathing down their necks when ­contrasted with the family-style management of a Rahul Bajaj or Sivasailam. They advised the British counterparts accordingly. Thus the management passed into the hands of the Hindujas in 1987 along with Iveco-Fiat of Italy (which had a 10 per cent share in equity). Today’s streamlined assembly lines at Ashok Leyland. Namakkal had always been a veritable fortress for Ashok Leyland vehicles with 80-90 per cent market share. The drivers’ training school in Namakkal, a pioneering effort from a vehicle manufacturer, provided livelihood to the youth of the community with better driving skills. The economic and social success of the town is a measure of Ashok Leyland’s own success! I was present at the first press conference addressed by S.P. Hinduja soon after the Hindujas took over AL. I remember S.P. Hinduja expressing his expectations on IVECO fully extending its technological expertise that will enable AL to produce vehicles of standards comparable to those in G8 countries. Another illustrious suitor for this share was MAN of Germany. On a visit to the MAN works in Germany later, I learnt from a senior executive their disappointment in missing out on the deal; he rued that with their familiarity with Indian road and load conditions his company would have given much better technology and support. (MAN had provided vehicle production technology for defence. I remember the olive green Shaktiman trucks of Defence criss-crossing the country in the 1960s). The first A-40 Austins roll out. Sumati, from a poor farmer’s family, who had a broken marriage, joined AL’s Driver Training Institute in Namakkal to learn driving heavy vehicles. She started to drive a mini-bus and later worked as a bus driver of Chennai Metropolitan bus on temporary basis. Soon she got a job to drive farm equipment for the government. When farmers needed tractors, the government lends them and her job was to reach the tractors to the farmers. The collaboration with IVECO did not last long. There were issues on transfer of technology sought by AL. The company had better rapport with Japanese Hino Motors. Later AL also opted to focus on company’s own R&D. Post-2000 investments made in R&D enabled the company to introduce contin­uously improved products. 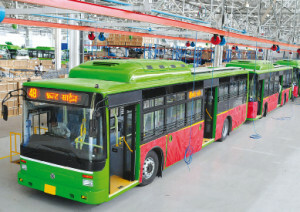 Buses rolling out from Ashok Leyland today. Sunshine built by Ashok Leyland as a safe and comfortable safe bus, has rollover protection with special crumble zones that ensures even if a bus topples over, it does not crush the children within. There is frontal crash protection that helps protect the children in case of accidents. The seats are anti-microbial and the buses are built with the use of RFID technology to track the children getting in and out of the buses. An associate product called I-Alert keeps the parents informed of the real-time status of their wards and the buses they are in. Over 1000 highly qualified and dedicated scientists and engineers, many drafted from large US auto companies and elsewhere, strengthened R&D. New designs like low-floor buses, increased electronics and new models were released in quick succession and there was focus on the emerging area of defence production. Under Seshasayee as Managing Director and later Executive Vice Chairman, AL made full use of the opportunities available in the liberal environment. The market was expanding and the industry enjoyed boom in frequent cycles. The opening up of the investments also witnessed the entry of large multinationals. There was the threat of increased competitions from new entrants like the German giant Daimler as also opportunities for collaborations. Seshasayee inducted prized managers like Vinod Dasari and invited specialists like Dr. V. Sumantran. A spate of new collaborations was into three joint ventures with Nissan; a joint venture with John Deere for earthmoving equipment and a few acquisitions abroad in Germany and UK. Manufacturing activities expanded in Bangladesh, Sri Lanka, UAE etc. But the depressed market conditions post – 2008 and the sector in the downturn of a business cycle demanded changes in strategy. The new collaborations proved a drain on AL’s resources. The Hindujas, Dasari, and their team decided to stick to knitting and the company terminated many of the JVs. Today the focus is sharp on the core business of commercial vehicles and expanding production for defence. With the new policy of the Government focusing on a large set up in defence production capabilities and thrust on exports. AL is busy building on the base laid for defence vehicles and equipment. For several decades AL was largely known only in the South. This has changed; with manufacturing activities spread to Maharashtra, Rajasthan, and Uttarkhand and a vastly expanded dealer network, in recent times, the North has ­replaced the South as the largest market for AL vehicles. Sales more than trebled in a decade and exports are recording handsome increases. There is a strong focus on customer service and customer orientation. These took care of the incomes and welfare of ­drivers, suppliers, customers, channel partners and community -(Courtesy: Industrial Economist).